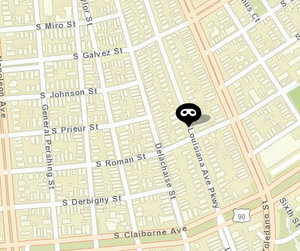 A man and a woman in their 30s and a teenage boy were robbed of a box full of cash by two armed intruders in a Louisiana Avenue Parkway home overnight, New Orleans police said Thursday morning. The man answered a knock at the door of a home in the 3200 block of Louisiana Avenue Parkway (near South Roman Street) around 1:15 a.m. Thursday, Oct. 25, and “two unknown males rushed in,” according to the initial NOPD report. One of the intruders, wielding two guns, forced the man to the floor at gunpoint while pointing the second gun at the 14-year-old boy, the report states. The other intruder, also armed with a gun, forced the woman into the bedroom “where she gave the subject a shoe box containing cash,” the report states. Both intruders then left the house.